Welcome to the Actrix Online Informer for December 2015. This month we offer you some advice on what not to post on Facebook this Christmas and why... There's nothing that'll ruin your holiday season more than coming home to find all your shiny new stuff's gone. We also introduce you to Geeks on Wheels, an exciting company offering you support for all your tech needs. They've just opened a shop in Wellington, and are ready to help you with whatever you need. And we finish things off with a quick note about a phishing scam going around, targeting all you KFC lovers. This month's YouTube feature sticks with the Christmas theme and is a video from the last silly season. Thanks to a team of merry WestJetters and the power of technology, we've learned that miracles really do happen. As passengers board their aircraft, they tell the screen their Christmas wish. Little did they know what would greet them on the luggage arrivals at their destination. A feel good watch that is bound to get you in the "Christmas spirit"! The end of the year is drawing near which means Christmas, celebrations, New Year resolutions and summer holidays! School is out this month and a lot of Kiwi families are packing the tent and heading off for some well-earned rest and relaxation. And while that sounds like a whole lot of fun, many Kiwis don't realise that writing posts on Facebook about your upcoming trip away is giving "the enemy" some seriously good insider tips. That's right – burglars are now relying on Facebook for information about when you are and aren't home. 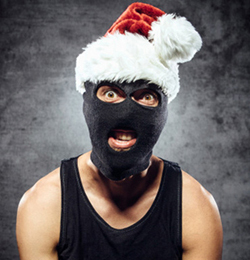 If you put on Facebook a post about all the wonderful Christmas gifts you received, and that you're going to be out of town for the next two weeks, that's a gold mine to a would-be burglar. In fact, the New Zealand Police are encouraging people to not discuss their holiday plans on social media. By all means, come home and upload your holiday photos for your friends and family to see, but updating your status with a message like "off on holiday for a few weeks! See you when we get back" is simply broadcasting to the public your house is empty. Alarm bells! It doesn't take long to track down an address and before you know it your house has been ransacked, and all that's left of your Christmas presents is the pair of socks you got from your Grandma. Tauranga-based Watchdog Security Chief Executive Brett Wilson said, "People need to be really careful and parents need to be monitoring their kids to make sure they aren't putting anything like 'Yay, we're away on a holiday'. It's not too hard for criminals to find friends of friends to find out where people live, especially with kids who have a large circle of friends." Another thing Police are recommending people avoid is posting photos and updates about the Christmas presents you've received. So if you wake up Christmas morning and find a new TV or a Playstation under the tree, it might not be a good idea to broadcast to the world that you now have an extra thousand dollars worth of electronics at your house. Ensure your Facebook privacy settings are secure enough that only friends can view your statuses. Do not accept a friend request from anyone you don't know. If you are going away over summer, get a neighbour to keep an eye on your house and ask them to empty your letterbox. Don't dump all the boxes from your Christmas presents in the recycling – anyone driving past will immediately be able to tell what cool presents are in the house, and you don't want that. We often hear stories from our customers about various computer problems ranging from simple to complicated. When a support issue is outside the scope of what we can assist with as an Internet Service Provider, we usually refer our customers to contact a qualified technician. Depending on your issue, you might find it easier to have someone visit your home on-site or to take your machine in to a tech's shop. Geeks on Wheels is a good option to consider. They're in all the main centres and have just opened a brand-new office (GeekHQ) in Wellington on Vivian Street. You're able to bring your computer in for both drop-off, as well as while-you-wait service. Geek's new headquarters compliments their existing on-site offerings, with special pricing starting at $30 for an initial diagnosis. If you need assistance beyond what we can help with, consider giving Geeks on Wheels a call. Kiwis should be aware of a new phishing scam targeting fans of KFC. A phoney website has emerged pretending to offer free deliveries of KFC within New Zealand. The website encourages visitors to enter in credit card details to complete the fake order, promising free delivery within 15 minutes. The website is the latest in a string of scams targeted at stealing credit card details from New Zealanders. According to GeekZone, the site is hosted on a '.co.nz' domain name and is registered overseas. Web users are encouraged to double-check the authenticity of the websites they use before providing personal details. You can read a little more about it here: www.geekzone.co.nz/forums.asp?forumid=164&topicid=182506. That time of year is here again when you struggle to think of gift ideas for your hordes of family and friends. These ten sites below should help you find something for every type of person you know. www.rebelsport.co.nz – This is a great site to help you find something for someone who enjoys sports or the great outdoors. Everyone's got that brother-in-law who is incredibly hard to buy for – so how about a tennis racket or some golf balls? www.livingandgiving.co.nz/ – With a fabulous sale section online, you are sure to find a gift for the friend who loves to spend time creating in the kitchen. From kitchen wear to candles and novelty gifts, this is a great place to shop for mums, aunties and grandmas. www.helfee.co.nz – Helfee has a whole range of health supplements aimed at 20-40 year olds who are "struggling" with first world problems. Their marketing style is hilarious, they've got a great range of supplements, and they're all cheap too. Each of their different products could make a great secret Santa gift, and allow you to pass on a subtle message to the recipient at the same time. www.thewoodentoybox.co.nz – With more than 400 toys to choose from, this can be your one stop shop for all the gifts for your nieces and nephews and all the grandchildren. These wooden toys all look like they're good quality, built to last, and best of all, affordable. There's also a handy search function which lets you search by price or the age of the child you need to buy a present for. http://www.vistaprint.co.nz/ – Don't want your significant other forgetting about you while they're working at the office? With Vista Print you can design and order a whole range of cool customised office supplies, so why not get them a mousepad with your face on it (imagine the fun they could have with that!)? And then you can get a coffee mug and coaster set to match. www.notsocks.co.nz – If you've set yourself the challenge of buying all your gifts from the same place, then this is the site you need to visit. You could jump on and cross everyone off your list within minutes. They have a whole range of gifts, from cheap novelty stocking-fillers to meaningful and worthwhile gifts. And with a huge price range, you won't walk away with an empty cart. www.giftbaskets.co.nz – Do you need to buy for the friend that already has everything? This is a good place to check out. Gift boxes full with cheese, crackers, condiments or a selection of sweet treats. A perfect gift for someone who already has it all. http://nz.strawberrynet.com/main.aspx?langBox=nz – Strawberry Net is an online cosmetics store that will tick off the gift for all the women in your life. Perfume is always a nice present, and there are a whole range of other cosmetics and the like. Just note that delivery comes from the USA so place your order well in advance if you want it to arrive in time for Christmas! www.thecleverdesignstore.com – A great place to check if price is no object in gift purchasing. Most items have a hefty price tag but the quality and design of these gifts are exquisite. www.giftstation.co.nz/ – Sometimes it's just too tricky to pick a gift you know the recipient will like. Maybe there are too many options? Or maybe they're just really fussy and hard to please? So how about a gift card? This website has a range of vouchers for stores all across New Zealand, that'll let the recipient choose the gift they want most. How to buy tech as a Christmas present : Tech is one of the most popular types of presents you can give at Christmas, but buying gadgets for others can be tough. Are they an Apple or Android person? Do they already have a tablet? Do they prefer Xbox or PlayStation? Click here for more. Kid tracking technology unveiled by Air NZ : Air New Zealand is offering a new service where it'll equip children with special bands that track and update parents on their whereabouts when flying on their own. Click here for more. YouTube Kids app launches in NZ : YouTube has launched a family-friendly version of it's app in New Zealand. The app, which is free for Android and Apple devices (but not desktop), features voice search, a timer to limit use, restricted search settings, and removes the ability to make comments. Click here for more. Is Technology Making Us Dumb and Numb? : As we spend more and more time connected to technology, we're spending less and less time connected to each other. And as we spend more and more time connected to technology, we're multitasking more. That's a problem. Click here for more. Smart home technology can be a bonus when you're looking to sell: It won't be too long before smart home technology is up near the top of the shopping list for those looking to buy a new home � right alongside location, good indoor-outdoor flow and the number of bedrooms. Click here for more. That theory about LED lightbulbs transmitting data? It's true. Li-Fi is here. : What if every light bulb in the world could also transmit data? In July 2011, Harald Haas, a professor of engineering at Edinburgh University, poised that rhetorical question to a TED Global audience. Then he went on to answer it. Broadband would be plentiful, nearly as limitless as oxygen itself, as it flowed from a standard-off-the-shelf LED. Click here for more. 9 Gmail hacks that will supercharge your inbox: Email overload is an expensive productivity killer for companies and individuals alike, but there are many ways you can make your inbox bearable. Click here for more. The five biggest social media scandals: Remember the good old days before social media? When friends chatted to you over a meal rather than taking pictures of it, when there was no proof of quite how terrible you looked after five sambuca shots last night, and when celebrity indiscretions could be swept under the carpet rather than hung out online like dirty laundry? Click here for more. The Most Valuable Social Media Tool You Are Overlooking: It's one of my favorite social media platforms for conveying thought-leadership and sharing value with a target audience. Click here for more. I went on a week-long social media diet, and here's what happened: The day I gave up social media, I went on Facebook three times. Each transgression was accompanied by an anguished cry when I realised what I'd done. I didn't click, I didn't even scroll, but I'd be lying if I said I didn't get a tiny rush when I saw I had unread messages. Click here for more. For Instagram, video is the future : Mike Krieger is still reeling from California-to-Europe jet lag, but when you ask him to recount the past five years, he perks up instantly. Krieger has no trouble rattling through a list of highlights: in 2010, he quit his job to help a friend build a smartphone app for sharing photos. Click here for more. 10 Quick Tips to Help You Create Facebook Ads That Work : I love data! Diving into a pile of numbers and discovering hidden treasure makes me (almost) as giddy as finding a good pair of designer shoes on clearance. My firm is responsible for millions of dollars in ad budgets for our clients, and it's our responsibility to manage those dollars wisely. Click here for more. Apple To Abandon Headphone Jack? New Leak Reveals Massive Gamble: Picked up by the ever reliable 9to5Mac, it reports that "Apple plans to remove the 3.5mm headphone port from the upcoming iPhone 7, helping to achieve a 'more than 1mm' reduction in thickness compared to the iPhone 6S." This would create the thinnest iPhone ever made. Click here for more. Three things you should know about the new Apple Pencil: Apple's new Pencil marks a significant departure from the company's previous strategy in which it avoided manufacturing or marketing styluses. Click here for more. Top 5 reasons I'm thankful for Android: Now that you've stuffed yourself with food, spent time with family, watched football, and enjoyed all the trappings and trimmings of the Thanksgiving holiday, let me take a moment to reflect on the less important... why I'm thankful for Android. Click here for more. Microsoft Surface Pro 4: Is It Worth Your Money? : Is the Surface Pro 4 worth your money? Microsoft's big, expensive tablet/laptop hybrid has some serious competition in the iPad Pro, but it manages to stand firm as a device that you should seriously consider buying. Click here for more. 3 Lessons Small Businesses Can Learn From Amazon, eBay and Etsy This Holiday Season : As more and more tech and Internet giants emerge, their names are becoming virtually synonymous with the service they provide, as in: "Google something," "Facebook someone" and "I got it on Amazon." It's easy to forget that these companies began just as yours may have begun – in a garage, a dorm room or a nondescript office. Click here for more. Putting Money Into Security: I've long been immersed in the world of technology � as a hobbyist, a venture capitalist, a board member and now as a CEO. But looking back at key segments of my personal investment history, I'm struck by the story it tells about security. Click here for more. How to protect yourself from cybercrime this Christmas: Online fraud spikes during the holiday shopping season, as people searching for the perfect gifts take to cyberspace and head to traditional stores armed with their smartphones. Click here for more. Walk-Man the humanoid walks tall : In a world designed to accommodate the shape of the human body, anthropomorphic robots could have advantages over wheeled and animal-shaped robots that could help them integrate into society more easily. Click here for more. Melbourne's massive Lego Christmas tree: It took over 200,000 bricks to make the largest Lego Christmas tree in the Southern Hemisphere. Kookaburras and a koala sit high among the leaves of the 10-metre tree in Melbourne's Federation Square in Australia, while, closer to eye-level, an elf is playing cricket. Click here for more. Miners mourned on Facebook, Twitter: More than 100,000 members have joined groups on Facebook expressing their grief over the deaths of 29 miners at the Pike River mine. Click here for more. Just one third of NZ businesses have websites, says survey: New Zealand businesses have been slow to harness the power of the internet, with only a third owning a website and 20 per cent selling their products online. Click here for more. Search begins for NZ's ugliest website: Microsoft is offering a makeover – for New Zealand's ugliest website. Click here for more. NZ students gear-up for party on Facebook: More than 1500 Facebook users, most of whom appear to be students, say they plan to attend the "Castor Bay Beach Party 2!" on Auckland's North Shore in December. Click here for more. The death of the phone book: Telephone companies argue that most consumers now check the internet rather than flip through pages when they want to reach out and touch someone. Click here for more. Thanks again for reading the Actrix Online Informer. Feedback can be sent to me via the e-mail address listed below. Please limit this to comments/suggestions regarding the newsletter. The best place to send requests for support is the Actrix Help Desk (support@actrix.co.nz) or to the Accounts Department (accounts@actrix.co.nz).